The U.K.'s Telegraph describes the current situation in Europe as a mess and falling apart at the seams. No wonder currencies are so wild. 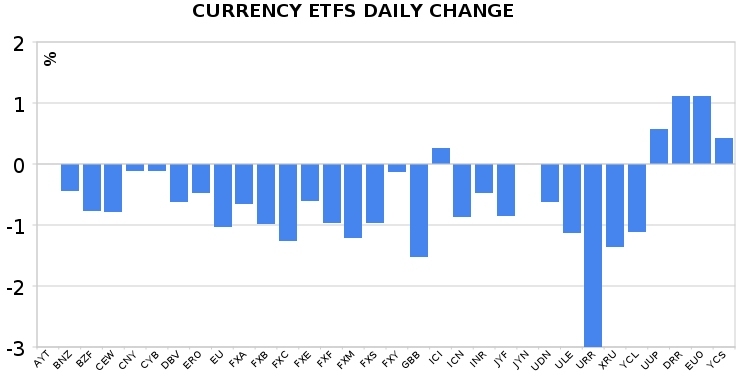 Above chart from our Tracking Live site of currency ETFs. "Europe’s hastily assembled bailout fund already seems to be coming apart at the seams, and that’s before Ireland has even tapped into it. Austria is refusing to contribute to the next tranche of bailout money for Greece, citing the country’s failure to meet conditions". "The way things are going, the facility will fail even before its wider fault lines have been fully exposed. Europe is making things up as it goes along, and a pretty desperate job it is making of it too. The extraordinary thing to outsiders trying to analyse these events is just how poorly prepared Europe was to cope with sovereign debt crises within its midst. Indeed the no bailout clause contained in the Maastricht Treaty seemed to deny the possibility of there ever being one". "It’s all a terrible mess, or as Terry Smith, chief executive of Tullett Prebon, puts it, “that’s what happens when some botched repair starts to come apart in a hurricane”. Quite so".